Flavonoid compounds were studied in healthy and parasitized poplar branches following mistletoe (Viscum album L.) attack. Two poplar cultivars showing different degrees of resistance to mistletoe: sensitive “Fritzi Pauley” (FPL) and resistant “Vereecken” (VER) were used. Flavonoids were detected and localized using histofluorescence after treating frozen sections with two specific reagents. Total amounts of flavonoids were determined spectrophotometrically. Defence mechanisms were induced during penetration of the primary haustorium. They consisted of inner periderm development and flavonoid accumulation. These reactions were weaker in the FPL cultivar than in the VER one. In the latter, growth of the primary haustorium and the establishment of direct connections between the living host cells and parasite failed. 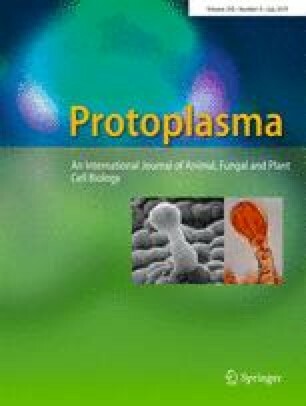 The resistance of poplar cultivars to mistletoe was dependent on the production of defensive mechanisms against the pathogen.